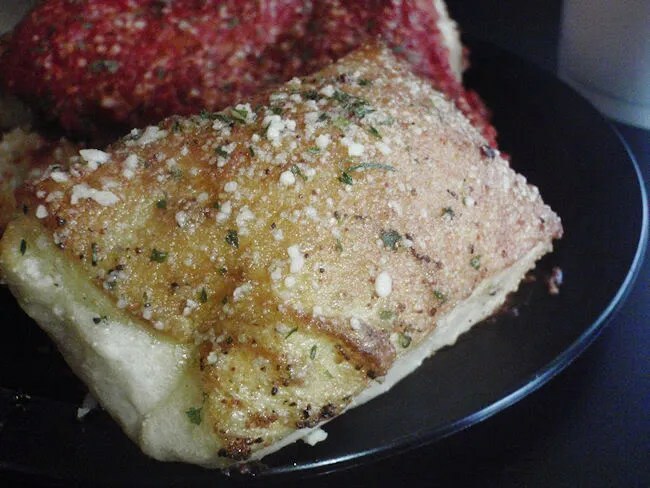 Erbelli’s Gourmet Pizza, Italian Bistro & Pub – Oshtemo Twp. 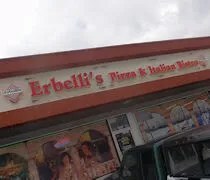 So, it’s been a year since we last tried Erbelli’s. 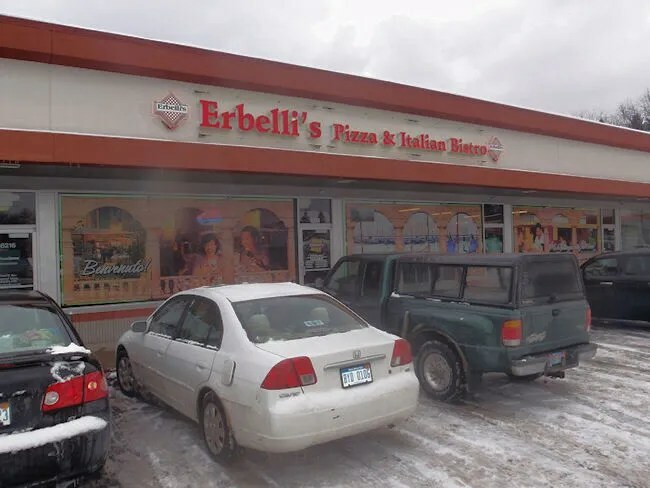 We keep hearing from almost anyone we ask that the best pizza in Kalamazoo is Erbelli’s. We ate at the Portage location last year for New Year’s Eve and weren’t really impressed. Now, we do have a ridiculously high standard when it comes to pizza so finding the right pizza is never an easy task. I can honestly say I’ve lived in Michigan for almost three years now and have never found a “craveable” pizza. That doesn’t mean we haven’t found any good pizza. It just means that when it comes time to order out, there’s always a decision. J sent me an e-mail from work asking if I wanted to go to Erbelli’s for lunch. She was looking at the website and saw a coupon for the lunch buffet. Sounded good to me and the price was right so as soon as she walked in the door, we were heading back out for some pizza. The Kalamazoo location of Erbelli’s is on Stadium Drive in Oshtemo Township between US-131 and 9th Street. It’s in a strip mall that sort of sits in a valley. The portion of the building that Erbelli’s takes up is decorated with Italian scenes on the windows. These are actually pretty interesting window treatments because they still let light in and you can see outside, but from the outside, you can’t see in. The space is divided into two rooms. When you walk in, you come to a really small carry-out area. There’s an order window, a fountain Pepsi machine, and a couple tables. There was a sign as we walked in that said to order at the window, so we did. I handed over my coupon and without having to say anything, the clerk rung it up and handed us two styrofoam cups for drinks. The total for two lunch buffets and the two drinks was a little over $15. The second room is the dining room/bar area. There were a couple large groups that took up a big portion of the dining room, but there was an open booth near one of the windows that we claimed before heading to the buffet. The buffet is in the back of the space past the bar. It’s not a big buffet, but it gets the job done. There wasn’t a whole lot on the buffet, but we were told there were more pizzas in the oven. We grabbed what was up there to get started. We were both hungry and there were still items on the buffet that looked good to us. We both grabbed a slice of the Stuffed Pizza. 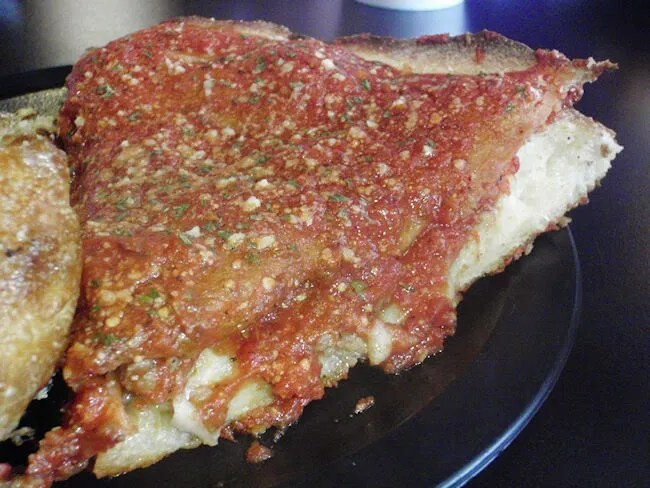 Like it sounds, the pizza is a homage to the Giordano’s Chicago-style pizza. 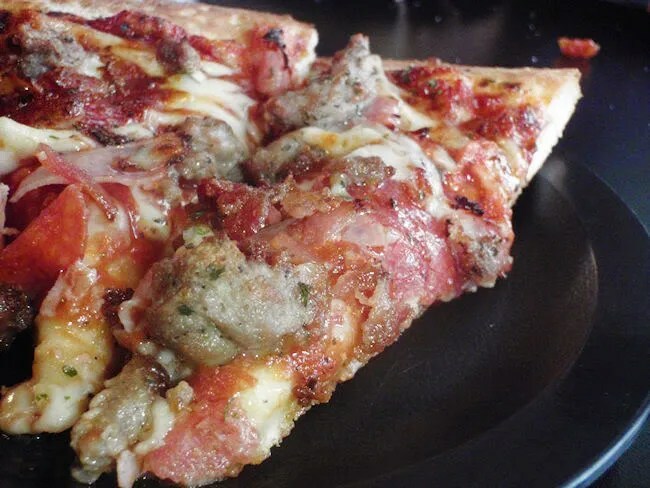 The cheese and Italian sausage were stuffed between two crusts that is then topped with a chunky tomato sauce. This slice was actually really delicious and I even think J liked it. She’s not usually a fan of the deep dish, but she went for seconds. I really liked the sweet Italian sausage. I also picked up a few slices of the Erbbie Bread and some breadsticks. I love the Erbbie Bread and that was one of the things I remember liking from our first trip. J really liked the breadsticks. 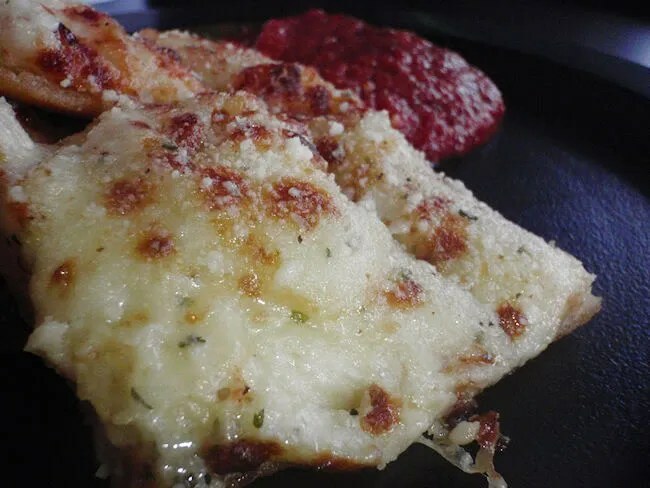 They had a dusting of garlic and Parmesan cheese on them and went really well with the pizza sauce. My second trip to the buffet was kind of a bust. There were no pizzas out yet, but I did grab some more Erbbie Bread to hold me over while we were waiting on the pizza. After I finished that plate, I headed to get more Pepsi and as I was walking back, I noticed some more pizzas coming out of the kitchen. We both got up, along with the rest of the restaurant, to get more pizza. On this third, and final trip, I grabbed two slices of a pan tossed pizza with a combination of ham, pepperoni, and sausage. I’m not usually a sausage guy, but I really liked the sausage on these pizzas. They had a dominating sweet taste to them that I really liked. The second trip to Erbelli’s was much better than the first. I’ve really been wanting to give them a second chance for a while, but we haven’t ordered good pizza (ie. not a delivery chain) in a while. I still want to go back some time and actually order a pizza. There’s so much on the menu that I’d like to try. I just notice they have a Square pizza and I saw in the paper a few weeks ago they get BBQ from Q-It-Up.